Mr. Giovanni Bautista Perazzo, an Italian gentleman from Genoa Italy, became an "undertaker", as it was then called, at the turn of the 19th century. He was a man of progressive ideas, forbearance and had the quality of making everyone feel at ease. He appealed to and impressed everyone he had occasion to meet and his congenial personality had earned him thousands of loyal friends. His two sons, Sylvio and John and also his daughter Alvina ably assisted him. In 1926, he erected G.B. 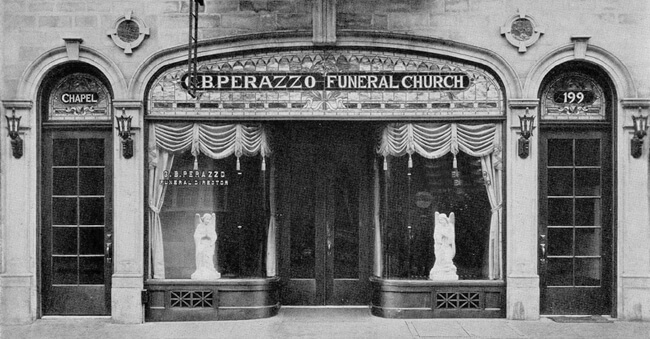 Perazzo Funeral Church at 199 Bleecker Street in Greenwich Village. G.B. Perazzo with police officer and clergyman. It was without exception the finest and most complete and modern funeral home in New York City. It was not a converted townhouse, but a newly constructed building, architecturally designed as a funeral home. This was during a time when most wakes took place in the homes of the departed. In 1987 John Perazzo, grandson of G.B., decided that he wanted the tradition of his grandfather to continue. Without any heirs to succeed him, he saw the opportunity to continue the proud heritage of his family with a young funeral director named Peter C. DeLuca. Since then, Peter DeLuca has expanded immensely upon the proud and reputable tradition of the Perazzo family. The facilities have been impeccably renovated, restored, and beautifully furnished. 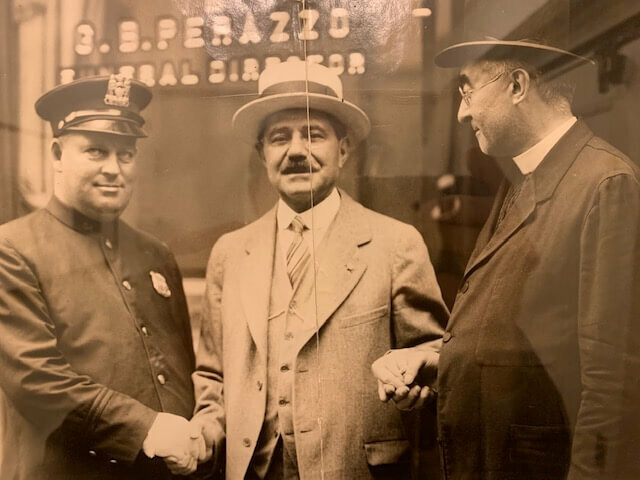 Peter will continue to care for and serve the Greenwich Village community and its surrounding areas with the same professionalism and respect that the Perazzo family demonstrated for almost a century.